Wed & Thur will run on Friday. Please refer to the recycling calendar for recycling pick-up. There will be no yard waste pick-up this week. Extra boxes from Christmas will be picked-up curbside this week. Please refer to the recycling calendar for recycling pick-up. There will be no yard waste pick-up this week. Proposed Subdivision Regulation Update: The Hartselle Planning Commission will consider adoption of updated subdivision regulations at its regular meeting on January 8, 2019, at 8:00 AM. The meeting will be held at Hartselle City Hall, 200 Sparkman Street NW. A public hearing will be held prior to commission consideration of these regulations, and anyone wishing to address the commission will have the opportunity to be heard. The proposed document may be viewed here, or at Hartselle City Hall between the hours of 7:30 AM and 4:30 PM Monday-Friday. This letter is to inform you of a change in the pickup of your recycling bins. Currently, we are picking up recycling in the blue bins on the second and fourth Friday of each month. Due to changes that have occurred outside of our control, the recycling schedule will need to be changed. This change will take place beginning the second week of September. Your zone and pickup days are listed below. A map of the city marked with each zone and pickup day is also enclosed, along with a collection calendar on the back of the map. 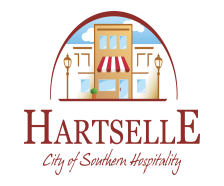 Both the map and calendar may also be viewed on the city’s Facebook page and website, www.hartselle.org. Please feel free to call the City of Hartselle Public Works Department at 256-773-2643 for additional information, or if you are unsure of your location on the map. Thanks for your time, and I again hope this transition is an easy one. • Barkley Bridge area and intersecting streets, including Higdon Rd and Glenwood Subdivision. • Groover Road, Garner Road, and all neighborhoods in this area, including Lake South, Shoal Creek, etc. • Salem Road areas, also all streets around Sparkman Park. • Crestline area, Mitwede and Puckett Road areas. • Main Street West, and all streets between Warren Road and Woodward Square. • Nanceford Road, Penn Road, Rice Road and all areas and streets intersecting and connected. • Mason Acres area, Tunsel Rd, and all streets intersecting. • Hwy. 36 West from Rice Rd to Ironman area and all streets and roads intersecting. • Ausley Bend Areas, Moss Chapel areas and all streets intersecting. • Vaughn Bridge Road and all streets intersecting. • Rhodes, Peach Orchard (West) area, and Lane Road. • Areas East of Railroad Street and north of Hwy. 36 to Interstate 65. • Bluff Park, Bethel Road, Bethel Street and all streets intersecting. • Booth Meadows, Booth Ridge, and Kyle Road areas. • Tanner Heights, South Park, and Walker Road areas and intersecting streets. • Hwy. 31 South from Karl Prince Drive south. • Cedar Creek Church Road, Tabernacle, Parker and Byrd Road and intersecting streets and roads. • All areas around the old hospital building. • North Sparkman, Peach Orchard, Valley View and Whispering Hills and all streets intersecting. • Areas of Hwy. 31 South to Karl Prince Drive, Barkley, High, Corsbie (South), South Sparkman, Pearl Streets, along with streets intersecting. • All areas around Hartselle Junior High and Hartselle Intermediate Schools. • Areas east of Hwy. 31 South to include Rock and Hickory Street areas. • McGaugh and other streets intersecting. • Penny Lane and other neighborhood streets in this area. • McClanahan Street and continuing east on Main St. East (south of Main) with intersecting streets, Heritage Heights. The landfill will be closed on the first Saturday of each month.